Westchester Village is a well situated community of 461 homes, convenient to Birmingham schools, upscale shopping and a variety of parks and recreational activities. Located in the southeastern part of Bloomfield Township, Michigan, it lies in the general area bounded by Lahser Road on the west, Maple Road on the north, Cranbrook Road on the east and Lincoln Road on the south. The Village consists of four subdivisions which were developed in the mid to late 1950′s on what was formerly open farmland outside the western limits of the city of Birmingham. The original Westchester Village subdivision plot was recorded on November 10, 1954, and comprises 104 lots in the general area bounded by Lincoln, Lahser, Berkshire, Wadsworth, Middlebury and East Bradford. Many of the homes in this area were custom-built for the original owners. 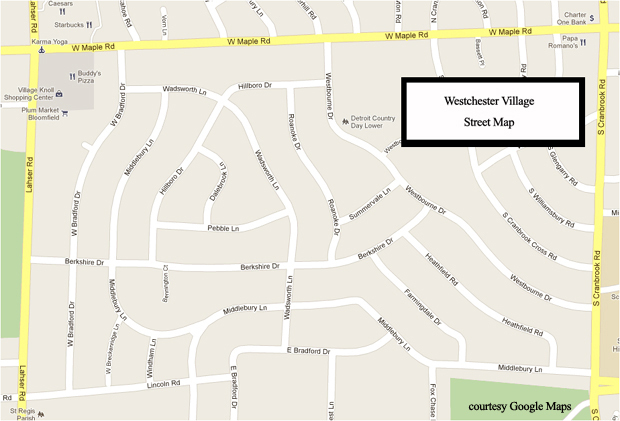 The first homeowners in this original subdivision formed an association called Westchester Village Association. Between 1955 and 1960, the Prudential Investment Company acquired the adjacent land and began developing the remaining area into 3 additional subdivisions. A separate association, called the Greater Westchester Village Homeowners Association, was established to serve those subdivisions which have a total of 357 homes. 2013 saw the merging of both of the above associations, creating Bloomfield Township’s largest HOA. Today, the Westchester Village Homeowner Association works to represent all four phases of the neighborhood in its activities. The Homeowner Association’s purpose is to maintain and enforce building restrictions, to protect and exercise the rights provided to property owners, to maintain and improve the residential character of the neighborhood, to promote cordial and friendly relationships among residents, and to work toward the improvement and general betterment of the community. Westchester Village is a well situated neighborhood, located close to Birmingham schools, upscale shopping, with many recreational activities and resources at your disposal. Situated in the southeastern portion of Oakland County, the Village is an evolving neighborhood of new families with young children, established residents, and the draw of large size lots for new home development. Homeowners: This site was created by your Homeowner Association to provide our residents instant access to important information that they may find most useful. Read about issues, upcoming events, and neighborhood announcements. We value your thoughts and are always looking to improve on what we are doing in the neighborhood. If you would like to share your thoughts, concerns, comments, kudos, anything you’d like to share please feel free to send us an e-mail with your suggestions.